Anke’s father is abusive to her brother and sister. But not to her. Because, to him, she is like furniture— not even worthy of the worst kind of attention. Then Anke makes the school volleyball team. She loves feeling her muscles after workouts, an ache that reminds her she is real. Even more, Anke loves the confidence that she gets from the sport. And as she learns to call for the ball on the court, she finds a voice she never knew she had. For the first time, Anke is making herself seen and heard, working toward the day she will be able to speak up loud enough to rescue everyone at home— including herself. As a teenager Thalia Chaltas wanted to do everything, and she envied people who knew without question what their life goal was. Thalia did preliminary training to be a kinesiologist, a helicopter pilot, and a fire fighter, and has at times been a bus driver, a ropes course instructor, and a contralto in an a capella group. Along the way she has played lots of volleyball, written poetry, and collected children’s books. And eventually, that anvil fell from the sky and she realized writing was what all this previous intensive training was for. She has kept every poem she has ever written – except one. Because she can’t find it. Thalia lives in California with her daughter. 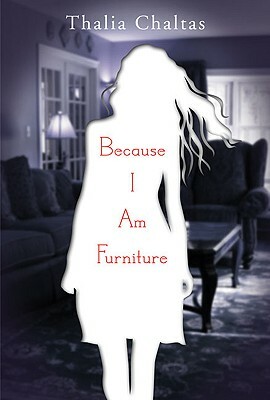 Because I Am Furniture is her first novel.